Indie Retro News: A600 Vampire II - A beast of an accelerator coming to the Amiga 600 with pre-order! 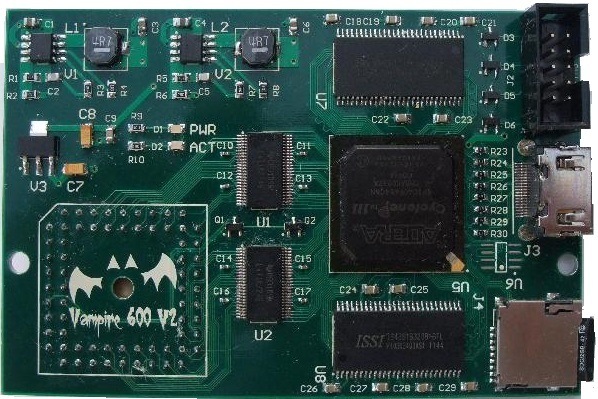 A600 Vampire II - A beast of an accelerator coming to the Amiga 600 with pre-order! Of all the Amiga's to own right now it just has to be an Amiga 600, especially as they are about to get one of the fastest accelerators that even Amiga 1200 owners will be sat at home drooling over. Welcome to the ' Vampire 600 V2 ', a powerhouse of technical marvel by Igor Majstorovic, (Majsta). and tcore (CPU) by Gunnar von Boehn, (BigGun) that is faster than an Amiga 1200 with a 68060 accelerator running at 80MHz with very little heat or power consumption all for the low price of €150! Also according to the creators, The Vampire II will sit on top of your original CPU and take full control of your Amiga. It will also feature 128MB Fastmem Ram, HDMI Digital Output, SD Card storage, a 64 bit core, full 32bit compatibility, direct core updates and FPU and 16 bit Audio planned for future updates. All of this available within the next 2 weeks hopefully (31 Dec 2015) with a pre-order available tomorrow 21st December. A worthy addition indeed, and if you want what's best for your Amiga 600 you can do no wrong with the beast that is the A600 Vampire II! Further details such as pricing and ordering is available on the source site below.